A coworker had warned me that this was going on today...but it wasn't until I saw this photo on Shakesville that it really hit me. This image is from a hearing against the Obama administration's requirement for employers to provide birth control to their employees. 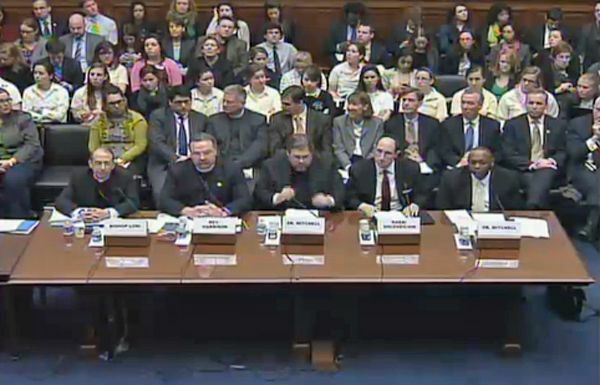 And there's not a single uterus-haver on that section of "experts" who are being called to testify. Actual photo, via Echidne. As you can see, the entire front row of "experts" are men. Thomas: "The hearing will feature 10 witnesses—eight of whom are men; none of them is testifying in support of contraceptive coverage. [Issa] refused to let a female law-school student testify about the importance of birth control. I guess women who use birth control just don't know as much about it as men who are against it." It's such a stupendous joke that Democratic Representatives Eleanor Holmes Norton of the District of Columbia and Carolyn Maloney of New York have walked out. Me either, Melissa. Are there words in our language for this level of fucked-up-ery? Edit: You know what, there are words for this! I can think of a few: wrong, selfish, over-reaching, ignorant, uncompassionate, and nonsensical to name a few. PLUS, even if the panel was actually representative of people who do have uteruses, what does their personal experience/thoughts/feelings really mean for the access of ALL people to birth control? I mean, really! But it's not about birth control. It's about religious freedom for employers and insurance companies! About which subject men are obviously more objective, considering that they do not have a uterus, which if you look at the numbers, tends to make one unfairly biased on this particular issue! In other words, I am going to lose my mind!